Monday evening, September 10 at 7:00 the Epsom Library will be hosting Stephen Hale, owner of Open World Explorers, as he brings his program, Back Yard Birds to our patrons. “The program features common and likely resident and migrant visitors to any backyard in New England. He will offer some tips on identifying some challenging birds that live among us like …Hairy vs. Downy Woodpecker and Purple vs. House Finch. He will also share information of feeding birds to attract the diversity.” This promises to be engaging and interesting evening. The movie matinee Wednesday, September 12 at 1:30 is 12 Strong. This film is based on real-life heroism and follows the first U.S. Special Forces team sent into Afghanistan in the harrowing days after 9/11. They must convince the general of the Northern Alliance to join forces in fighting the Taliban and Al Qaeda. They need to form an uneasy bond and overcome mutual distrust. This movie is rated R for war violence and language throughout. The Epsom Public Library will be having a community “Touch A Truck” event on Saturday, September 8th from 10 am to 1 pm. Join us for a fun, hands on opportunity to explore different community vehicles including a fire truck, police car, and construction vehicles from local businesses. We will once again have a Bounce House provided by “Blake’s Bouncy Business,” coffee and drinks courtesy of White Mountain Coffee and a raffle of Lego building sets. Refreshments will be provided. Truck drivers are invited to a complimentary breakfast beginning at 9 am. New drivers/vehicles are always welcome to join us!!!! Call the library for more information at 736-9920. Friday, September 14th 6:30 pm Avengers: Infinity War rated PG 13 includes pizza and drinks. On Monday, September 10th, at 2:00 pm, the Chichester-Epsom-Pittsfield Libraries Memory Café will enjoy a musical performance of harps and vocals at the Epsom Public Library. The Concord Regional Visiting Nurses will describe the benefits of music to stimulate the retrieval of long-term memories. Local caregivers and folks living with memory loss are invited to come enjoy music and conversation in a comfortable setting. Refreshments will be served. The Town of Epsom New Hampshire Fire Department is pleased to announce that it has accepted delivery of a brand new 2019 Ford F550 4x4 Trauma Hawk Type 1 Ambulance. This vehicle was built by American Emergency Vehicles (AEV) of North Carolina and purchased through Professional Vehicle Corp in Maine. Through hundreds of hours of attention, this ambulance has been customized to best serve our community. This ambulance has been specifically designed with a focus on safety, efficiency, and comfort for our patients and providers. This unit is equipped with a Stryker Power Pro XT cot and Power-Load system, designed to offer increased comfort while moving patients and to prevent one of the most common and costly injuries among emergency medical services and municipalities – lifting injuries. Citizens interested in getting a firsthand look at the new ambulance may visit the Epsom Fire Department during business hours. Thank you for your ongoing support. We serve the Town of Epsom and our surrounding communities with pride. This ambulance is outfitted with a Nitronox Field Unit. Recently, members of the Epsom Fire Department completed a training program that allows its providers to take advantage of protocol advancements to allow our Advanced Emergency Medical Technicians and Paramedics to administer nitrous oxide, commonly known as “laughing gas,” to patients suffering from injuries to extremities, such as sprains and broken bones in the arms and legs. Prior to this system, pain control medication has been exclusive to paramedics. This is an excellent and effective alternative to narcotics such as fentanyl, and for patients who have struggled with addiction. We are proud to be able to utilize this service to our community, and to play our part in fighting the opioid addiction epidemic. Being outfitted with a Stryker Power-PRO XT cot and Power-LOAD system, this unit is designed to reduce the risk of injury when loading and unloading patients by our personnel. This cot lifts and lowers itself and patient with the push of a button, whereas the loading system eliminates the need to lift the full load of stretcher and patient combined. This system, both stretcher and loading system, utilize a battery powered hydraulic lift system and have a maximum capacity of 700 pounds. Epsom Fire Department Ambulance 2 remains as one of the bariatric transport-capable ambulances in the Capital Area fire Mutual Aid compact. As one of many voters who is discouraged by the partisan bickering in Washington, I have been searching for a candidate for congress who will represent those of us who want what is best for our country and not what meets the needs of their particular political party. I have found that candidate in Lynne Blankenbeker. As a 32 year veteran of the US Navy and Navy reserve she has served her country as an operating room and trauma flight nurse deployed to the conflicts in the Middle East and Afghanistan. This experience has given her great insight into how to provide for a strong military and also how to move our health care system in the direction it needs to benefit both veterans and regular citizens of this country. As a former State Representative, she knows how to work with fellow legislators from both sides of the aisle. This is a skill which, in my opinion, is lacking in Washington today. She is a firm believer in balancing the federal budget and getting away from the contentious government shutdowns that benefit no one. Finally she is adamant that government needs to be streamlined in order to meet our needs and especially the needs of our younger generations that are struggling to achieve a standard of living that is even close to previous generations. I hope that you will join me in supporting Lynne Blankenbeker on September 11th in the Primary Election. I’d like to extend my appreciation to the Granite State Brotherhood Motorcycle Club of Epsom for their fine example of collective action on behalf of our community, with the donation of school backpacks. Our diversity is our strength and in working toward the shared value of compassionately helping one another, we reach beyond our differences and make the world a better place. 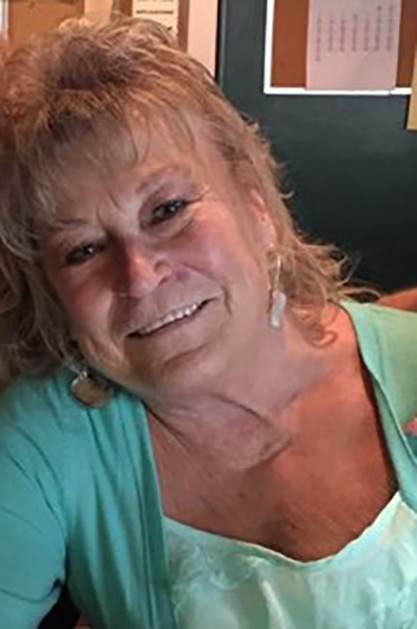 EPSOM – Gladys L. Gates, 69 of Epsom, passed away on Tuesday, August 28, 2018 at the Hospice House in Concord with her family by her side. Born on May 18, 1949 in Exeter, she was the daughter of the late Donald and Shirley (Pender) Gates. Gladys worked for many years as a hairdresser, a profession she truly loved. She enjoyed singing and was in a band during her younger days. She liked going camping, a chance to gamble and time spent with her family at gatherings. Besides her parents, she was predeceased by her sisters, Donna Gates and Lorraine Rudd as well as a grandson, Wayne Daniel Shannon. She is survived by her daughters, Tina Sprague of Alton, Darlene Labreque of Alton and Toni Cardinal of New Durham, her siblings, Carol Barrett of Epsom, Ronny Gates and his wife Patty of Epsom, Dicky Gates and his wife Jeannie of TN, Darlene Comeau and her husband Tim of Epsom, Cindy Merrill of Epsom, Debbie Tisbert and her husband Dan of Deerfield, Ricky Gates and his wife Karen of Pittsfield, Billy Gates and his wife Charlene of Hillsboro, Donny Gates, Jr. and his husband Steve Hall of Oregon, Reggie Gates and his wife Lynn of New Durham; grandchildren, Kara Shannon, Luke Cardinal, Ryan Sprague, Jamie Sprague, Breck Hodgden; one great grandson, Colton Sprague as well as numerous nieces, nephews and cousins.